Price includes postage within the U.K. Shipping to the U.S.A. add £30 Western Europe add £10. 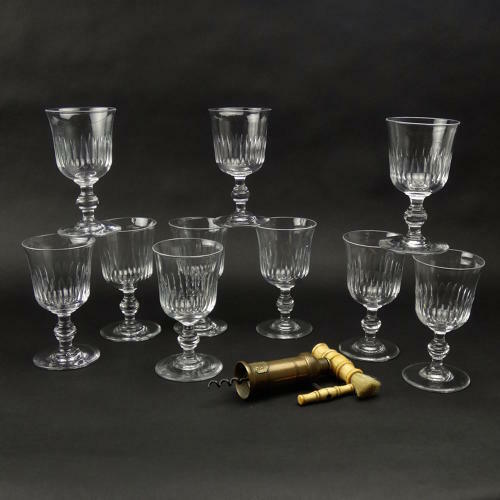 A set of 10, good quality, large, French crystal, wine glasses dating from c.1880. These glasses all have an elongated, elliptical cut design to the bowl and an attractive single knopped stem. They are a substantial weight, as they are made from a heavy, quality crystal, and all ten are in excellent condition. There will be marginal differences in the dimensions of the glasses in this set as they are all hand blown. Each one measures approximately: Height 15.2cm. (6in) Diameter at the rim 8.5cm. (3 3/8in) Diameter at the foot 8.3cm. (3 1/4in).